SF Modular RYDER direct-thread suppressors are built to the same exacting standards as our battle-proven Fast-Attach® SOCOM suppressors. 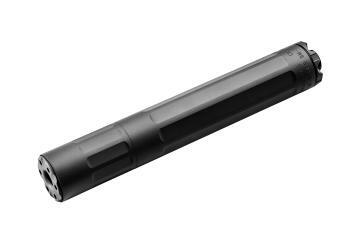 The SF RYDER 9M-Ti suppressor—for 9mm pistols and rifles—features an ultra-light titanium tube, front plate, and rear plate that help minimize weight with no sacrifice in strength. Inside the suppressor are durable heat-treated, stainless steel baffles that are indexed and numbered for easy disassembly and reassembly for cleaning. This model allows for the end-user to remove a 2” module from the front portion of the suppressor to reduce overall length. Simply reinstall the end plate on the now-shorter option and the suppressor is ready for use. Patented pig-nose baffles precisely direct gases from fired rounds for superior sound attenuation and reduced muzzle blast, while built-in spacers help reduce carbon buildup, which can adversely affect performance of a suppressor. A tough, Cerakote finish—helps protect the durable 9MTi, fits 9mm weapons with 1/2 x 28 threaded barrels. Easy removal of 2” modular section allows for shorter overall length of suppressor when needed.